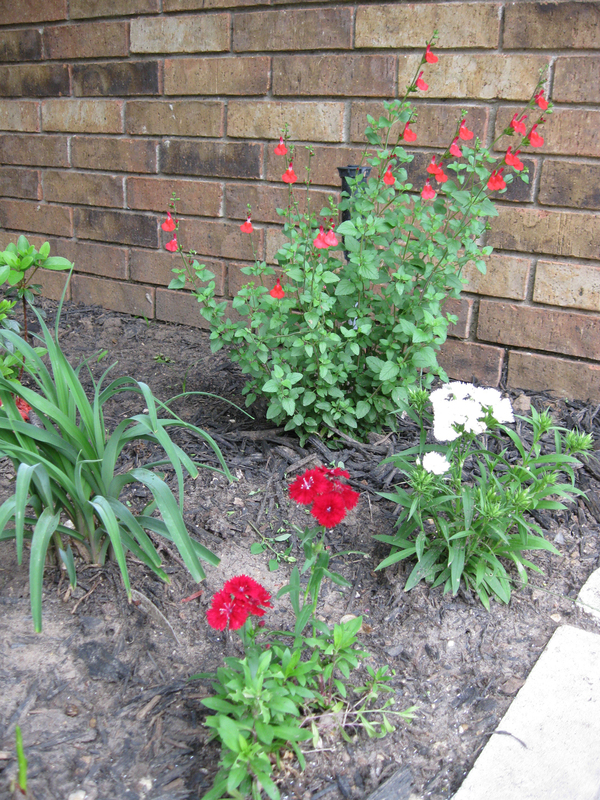 Failing to compromise on a shrub to place back of the front yard flower beds, I convinced the soon-to-be hubby that Hot Lips would survive the partial shade conditions. 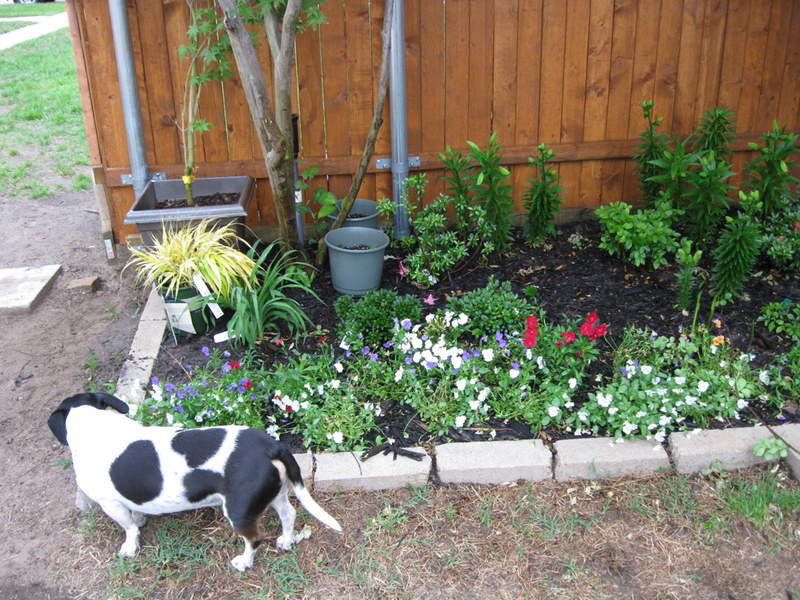 He relented and positioned them behind the 2 new Coreopsis (Sunrays?) 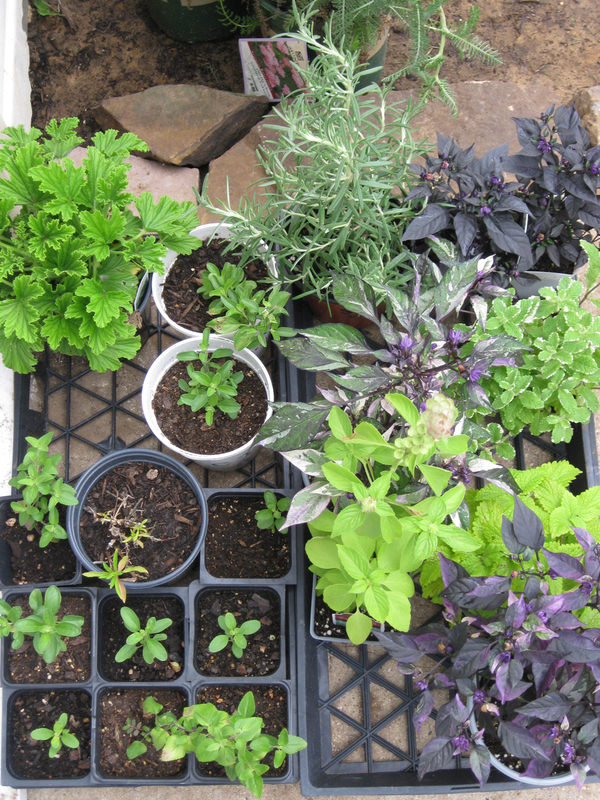 plants we obtained last week. 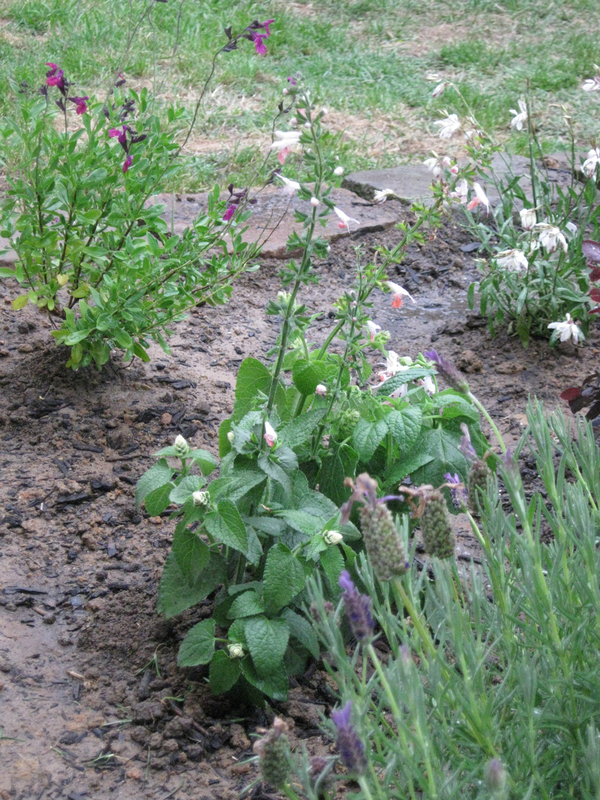 To fill in the rest of the holes, he planted the last of the Salvia farinacea Victoria Blues and 2 more of the Dahlberg daisies to flank the other end of the bed. 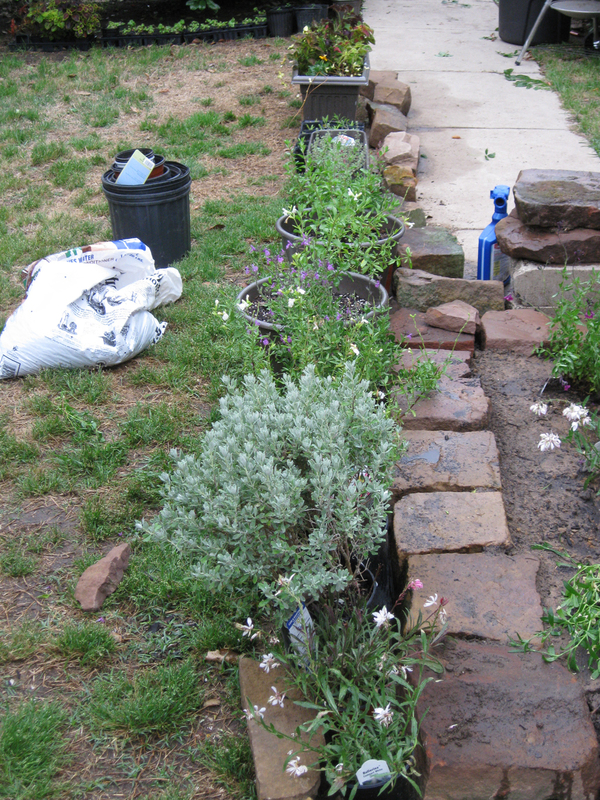 We also rented a tiller yesterday and dug along the neighbor wall to start planting the salvia row that I had originally planned out. 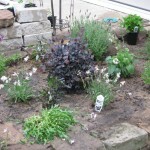 Unfortunately I ran out of compost about halfway into the plantings and the pesky bugs were beginning to attack viciously (as time approached sundown). 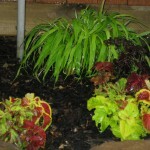 I hope to get the rest into the ground today, as long as I can obtain more soil amendment. 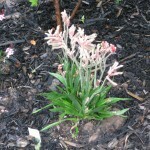 By the way, those medium-sized tillers really aren’t all that great when your soil is mostly foundation clay. 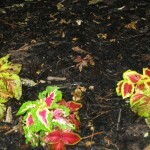 Sad news is that the yarrows we have planted aren’t looking particularly bright and cheery. 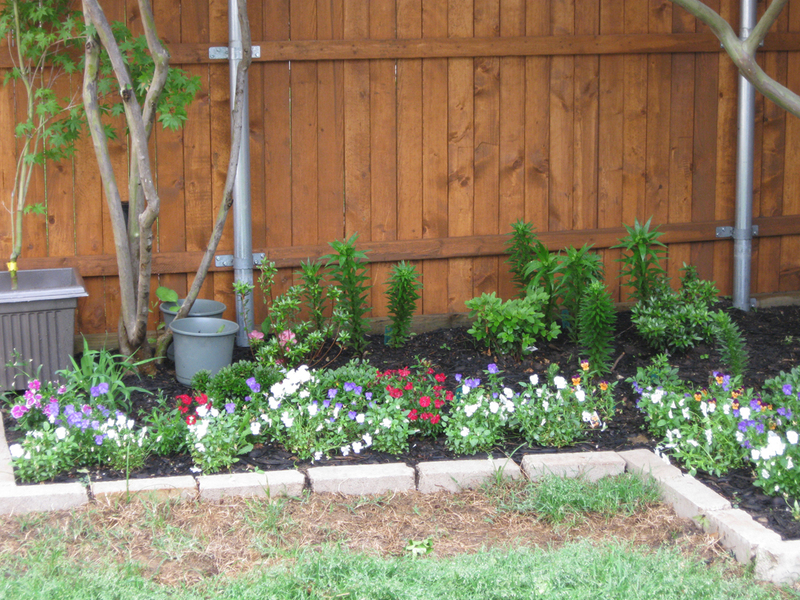 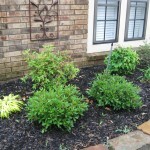 The extra watering they have been receiving has successfully sickened the rosemary plant we had flanked with them. 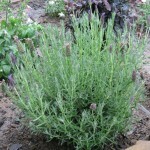 The needles have begun browning at the ends, and I’m not sure if the rosemary is in any condition to survive. 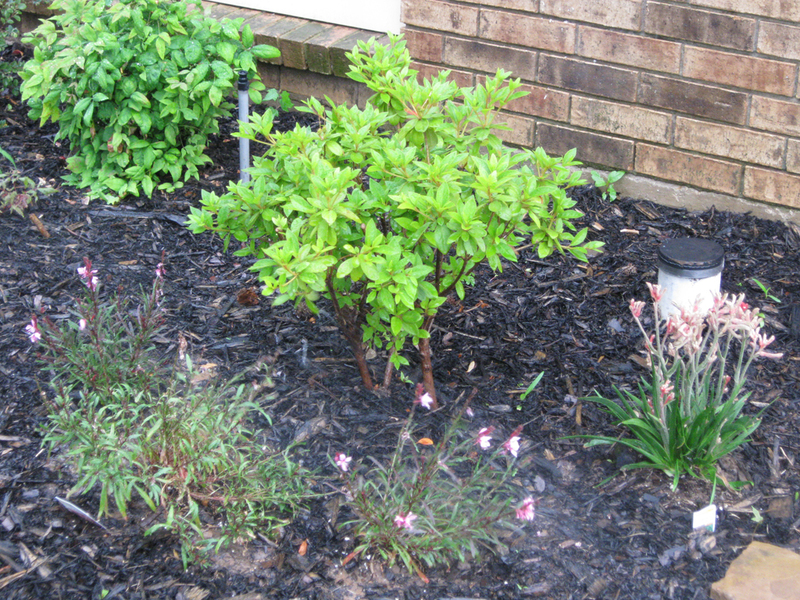 The Frostproof gardenia in front, while blooming wonderfully these past 2 weeks, has also begun to yellow (a sign of overwatering–which STBH finally admitted and confessed to). 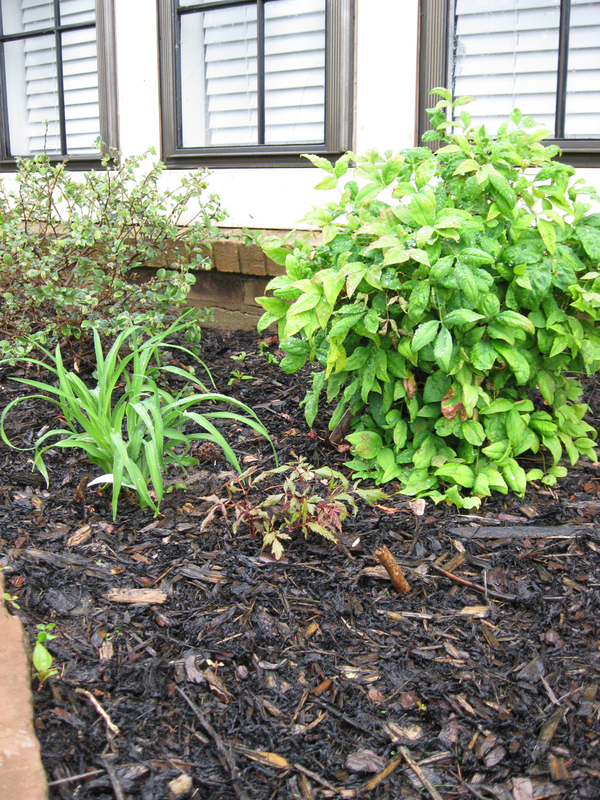 I’m speculating that acidity might also have something to do with it, so I’m suggesting removing the existing mulch and installing pine bark mulch. 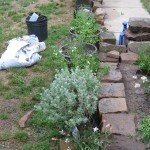 This weekend the hunny framed out the herb garden. 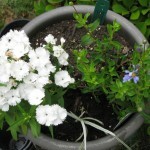 We took off to Strong’s to pick up a flat of Victoria Salvia and then over to Christina’s for a pot of Imperial Blue Plumbago and a flat of dianthus in purple shades. 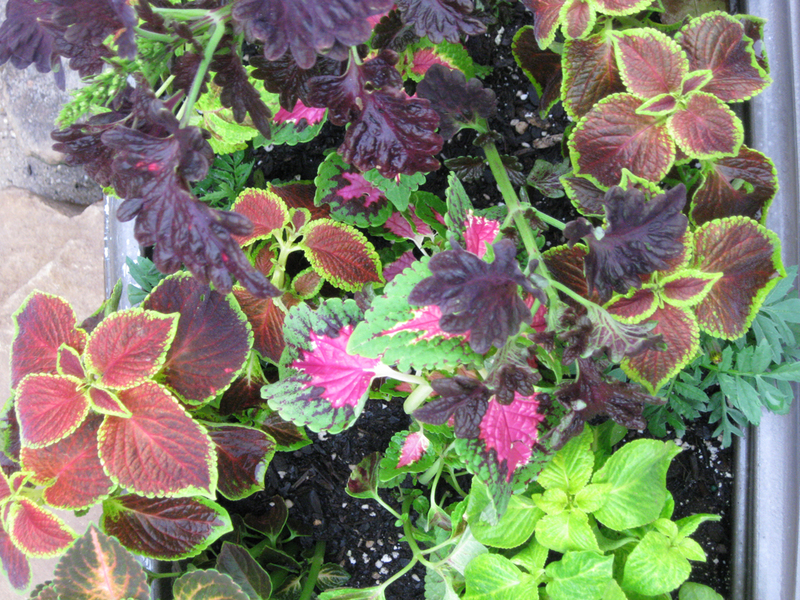 Mixed in with the picotees were Super Parfaits Strawberry and Raspberry, at least two pots of each. 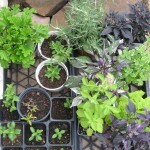 I have to remember to collect the seeds from these. 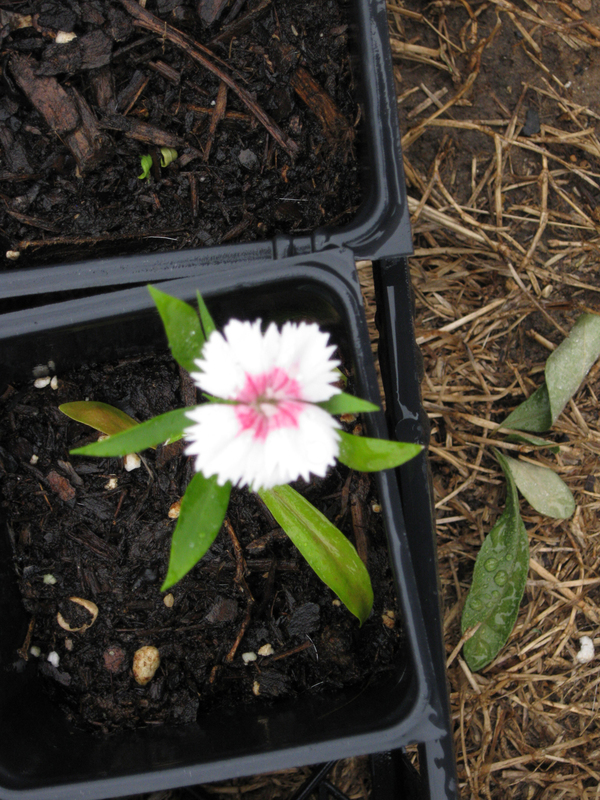 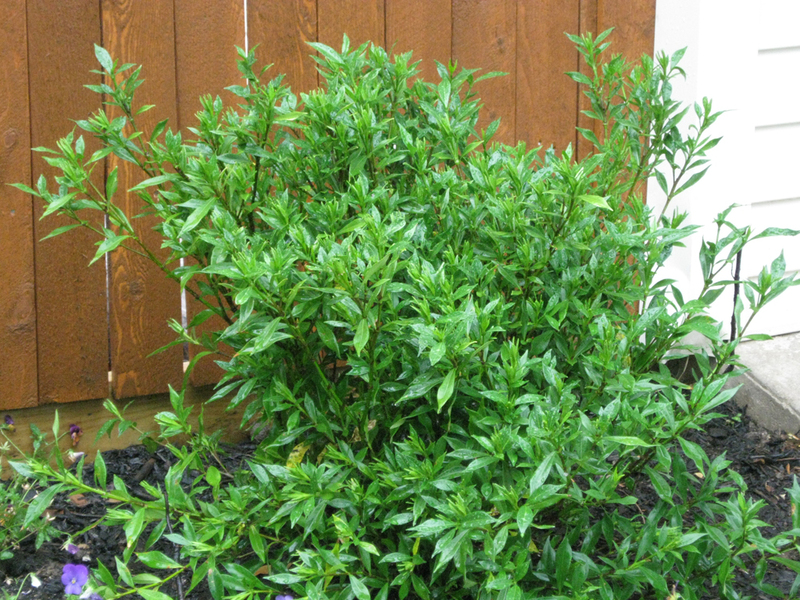 They seem to be shorter than the vigorous Ideal-type dianthus that I purchased with them, no more than 8-10 inches tall, and darker in leaf. 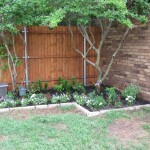 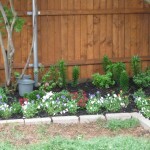 The Victoria Blue salvias were installed in the front flower beds for a splash of blue color and some vertical lift. 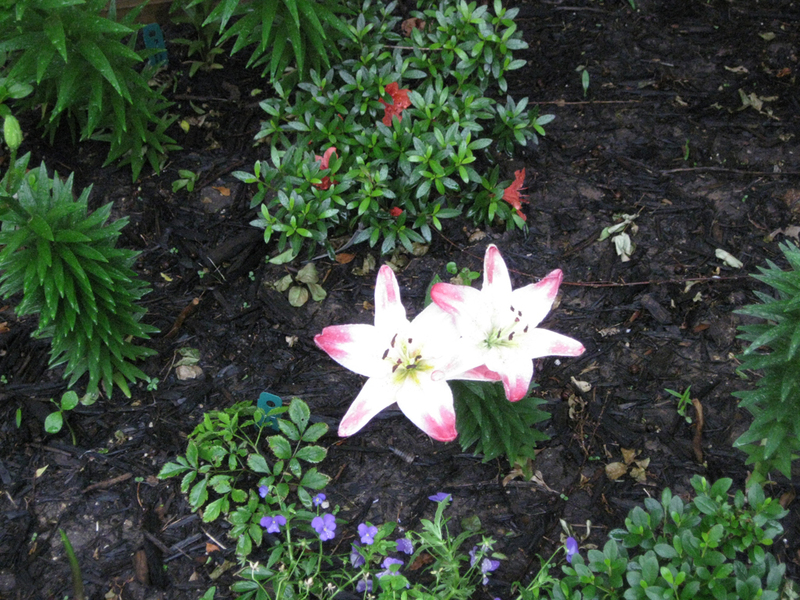 They contrasted quite well against the golden Japanese grass, the last of which we planted on the far end of the bed. 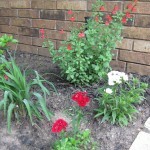 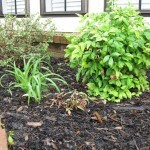 I’m almost convinced we should install the remainder of the salvia in the front bed just for the added blue color. 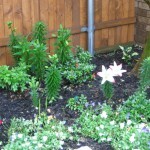 Not to mention the extra visits from bees and butterflies. 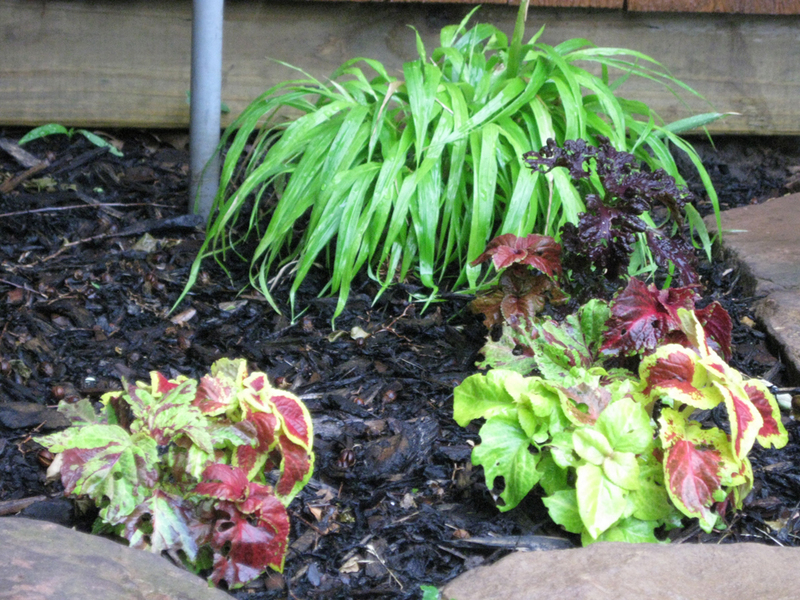 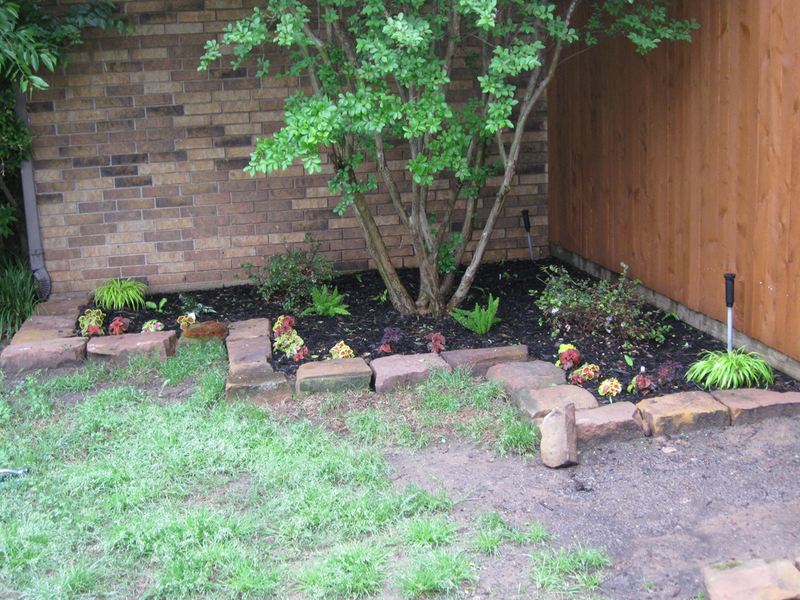 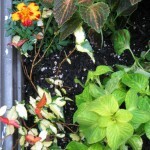 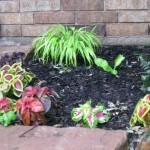 While digging in the front flower bed, we checked on the status of the astilbes and hostas. 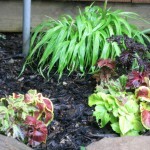 Apparently only one of the Minutemen hostas thrived–the other root was a dessicated ball. 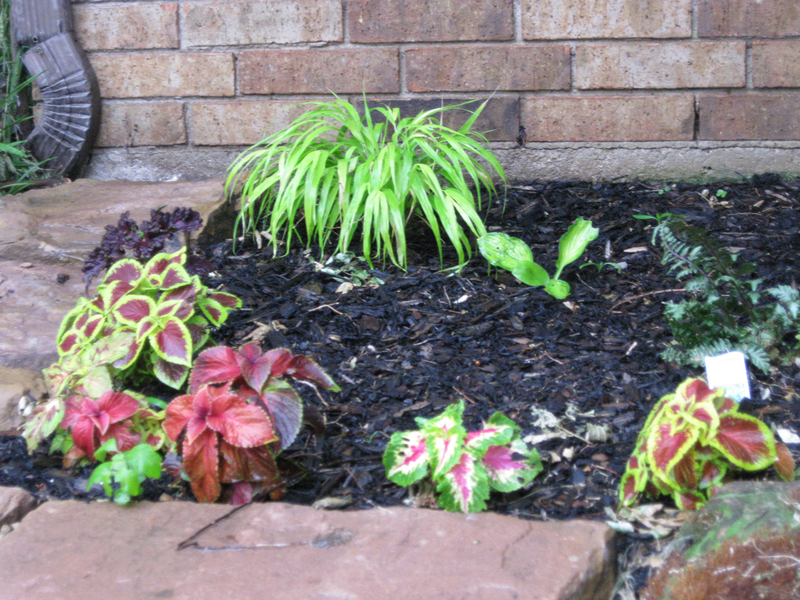 I’ve transplanted the hosta into a pot and put it in a sunnier location along with the potted Gold Standards, in hopes they will thrive. 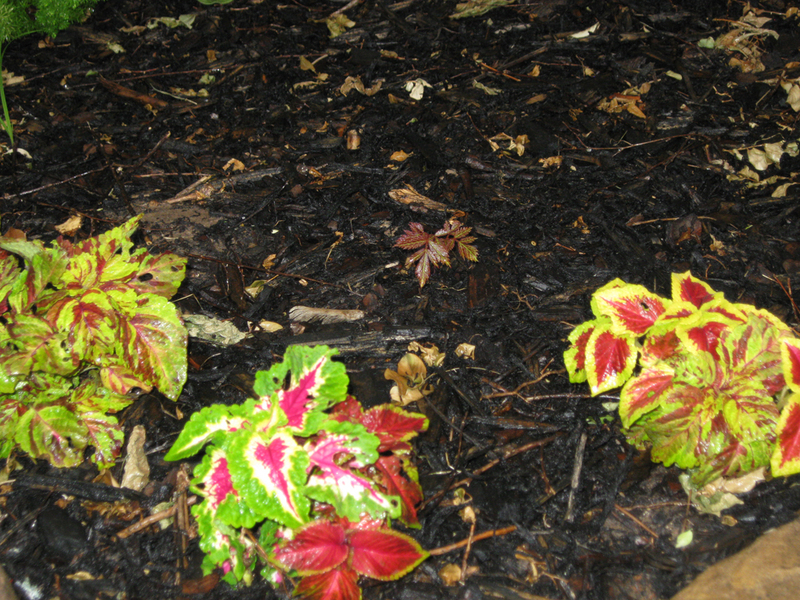 We also dug up the 2 remaining astilbes that haven’t made a showing, Fanal and Amerika. 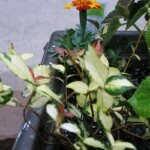 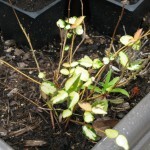 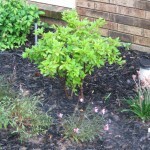 I potted the Fanal to place in shade, while we replanted the Amerika which seemed to be slowly developing. 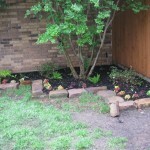 Hopefully these will catch up soon. 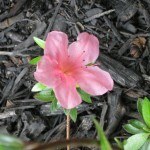 The third Lollypop bloomed this past weekend. 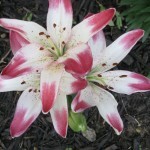 The next lilies burgeoning with buds are the Red Alerts, with their super-huge tubes ready to burst. 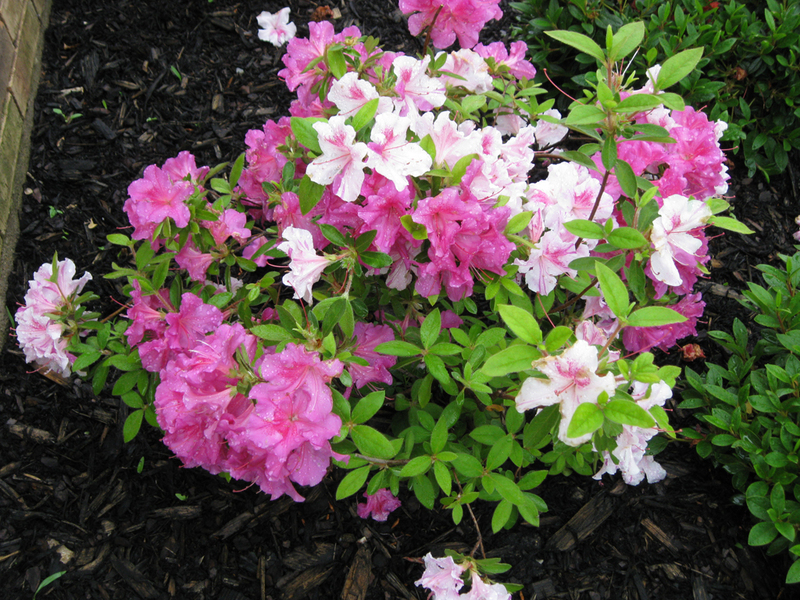 I have to also mention that the rest of the Gumpo Azaleas have started blooming their heads off this week, single-flowered whites and pinks. 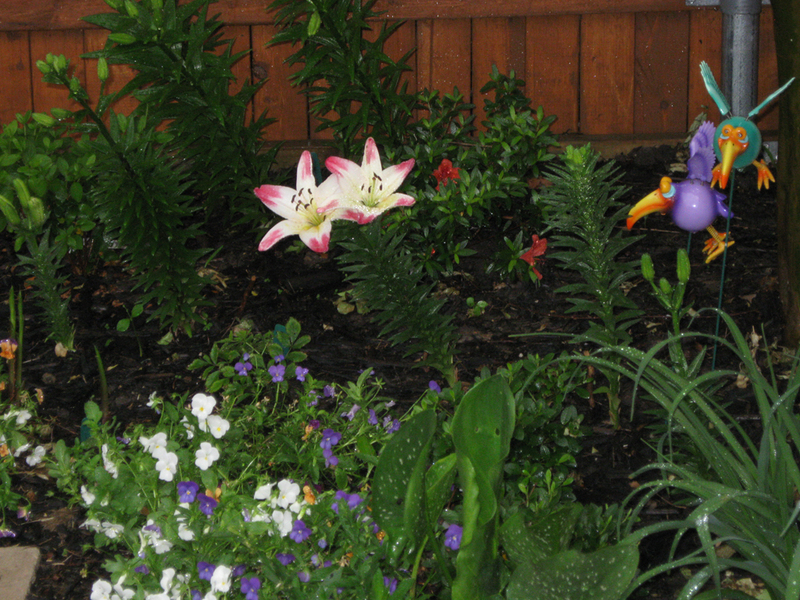 I’m almost tempted to purchase more calla lilies to cover the bare spot in the lily garden. 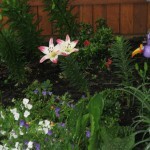 There is a difference between the callas blooming in full sun versus partial shade. 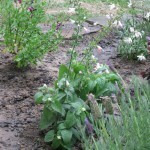 But the callas now have reached remarkable heights of 2-3 feet and show no sign of stopping. 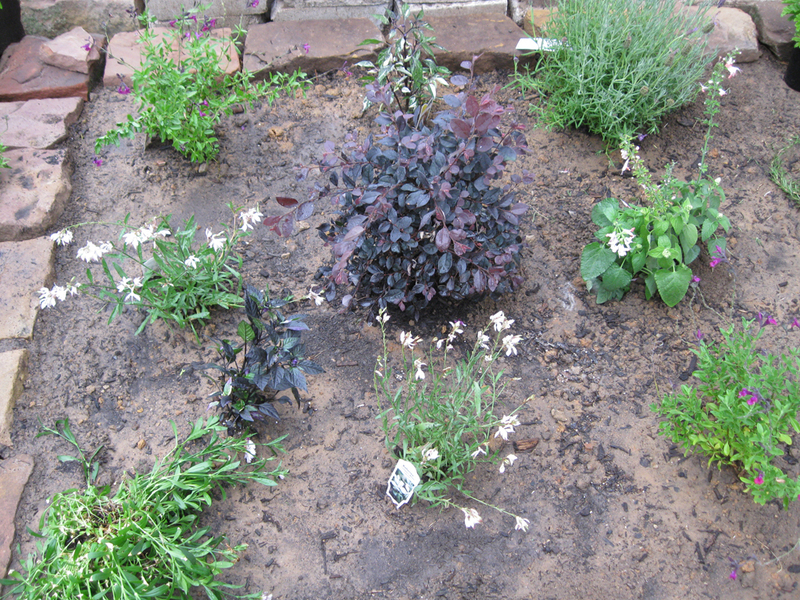 Other notes: transferred the chocolate chip ajuga to the spot vacated by a picoteed dianthus in the courtyard flower bed. 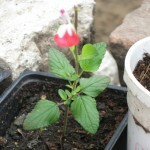 Many of the salvia cuttings have taken off, rooted well and are thriving. 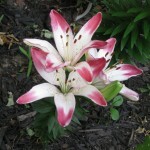 The last Picasso calla lily, one that I had potted on the patio, has sent up a shoot. 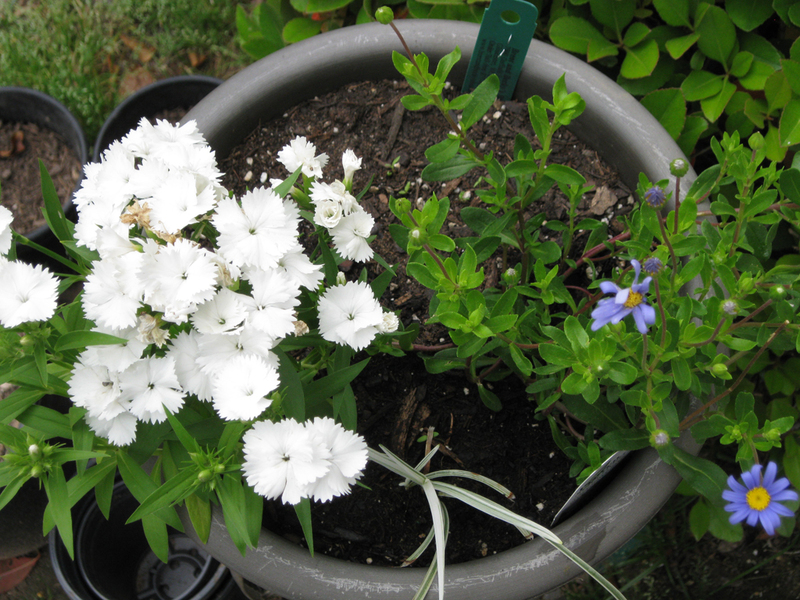 I emptied the cosmos seeds I had in the tree bed along with the last of the baby’s breath and forget-me-not seeds. 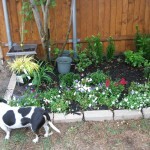 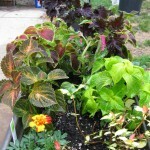 I put in another order for seeds yesterday, for cosmos, impatiens and sweet bell peppers. 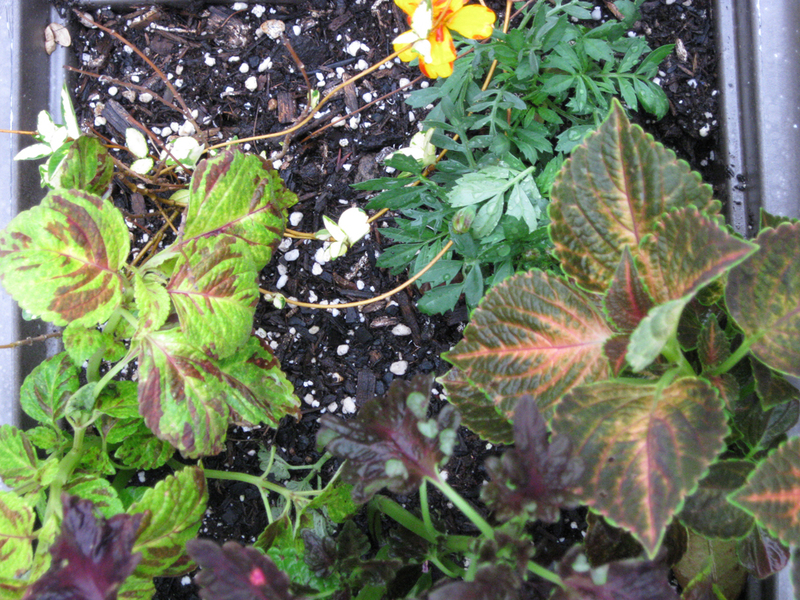 We can’t seem to not find anything we like at Strong’s Nursery: 1 basil lime, 1 lemon balm (melissa officinalis), 1 pineapple mint, one Spanish Lavender and another Hakonechloa Aureola (Golden Japanese Forest Grass looking a little burnt). 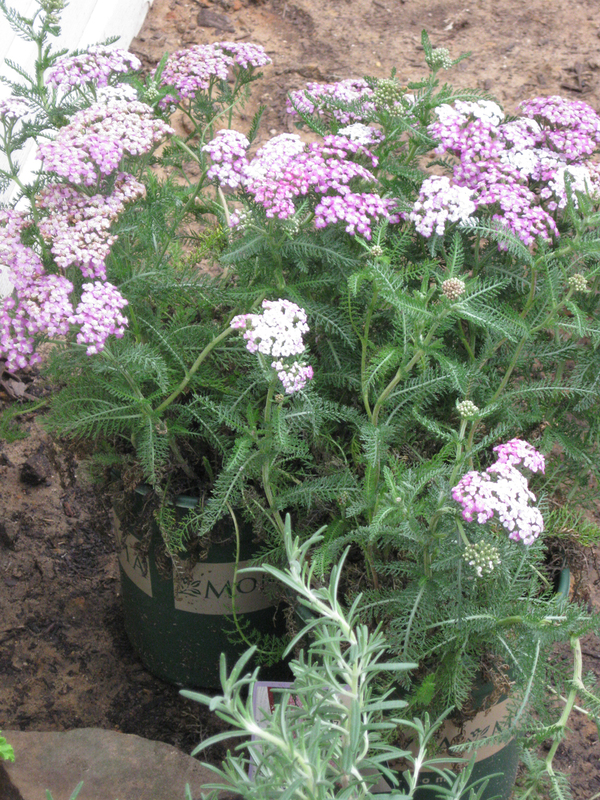 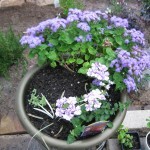 At Home Depot, we finally got our paws on 2 catmints, Nepeta faassenii, though they didn’t look at all too happy sitting out in full sun, plus a larger rosemary specimen, Tuscan Blue. 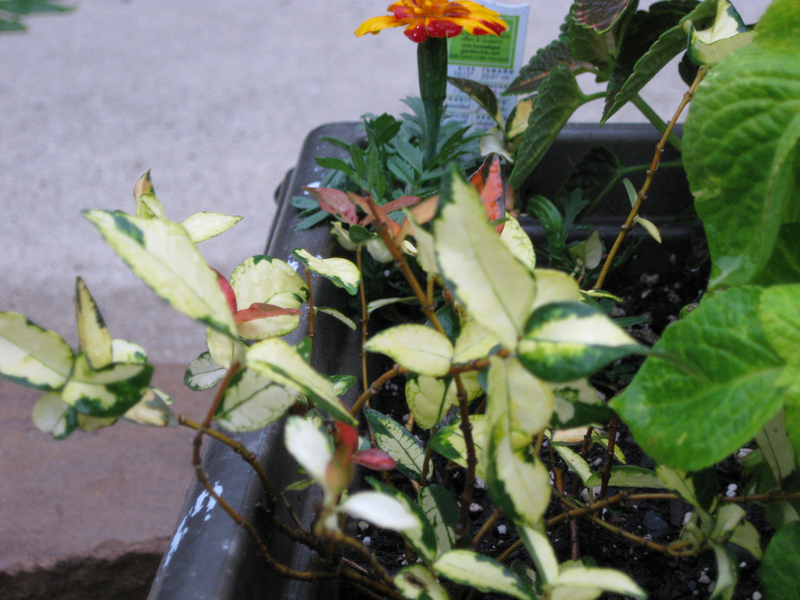 From there I also picked up a cheap 6-pack of marigolds (Durango or Safari series mix, Bolero being the choicest color), 2 more bicolor salvia coccinea, 2 Calico and 2 Purple Flash Ornamental Peppers, and a Tropical Breeze verbena (for my blue-themed planter). 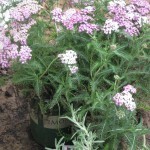 My man also picked up some sale items at Calloways, 2 Oertel’s Rose Common Yarrow and 2 Golden Fleece (Dahlberg Daisies). 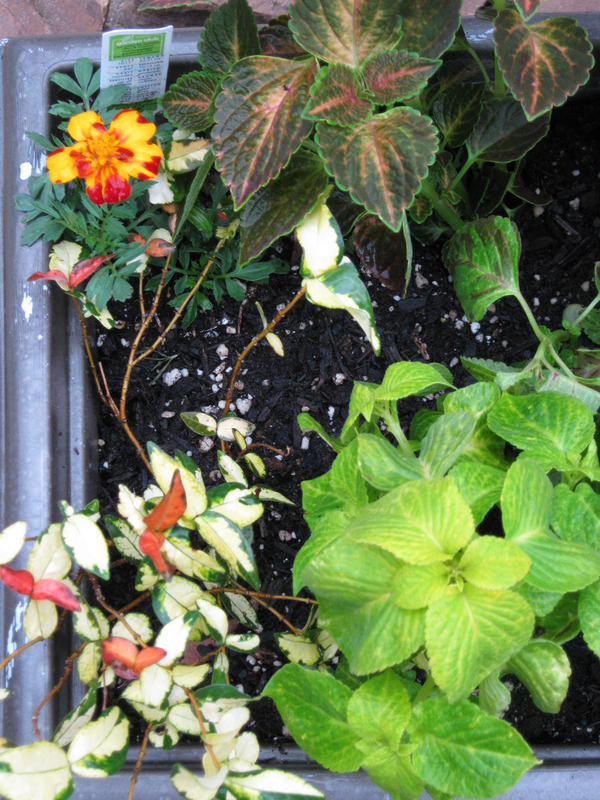 I planted my yellow-themed box with marigolds and coleus, with the old Salsa Jasmines as bookends to the box. 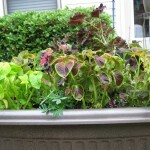 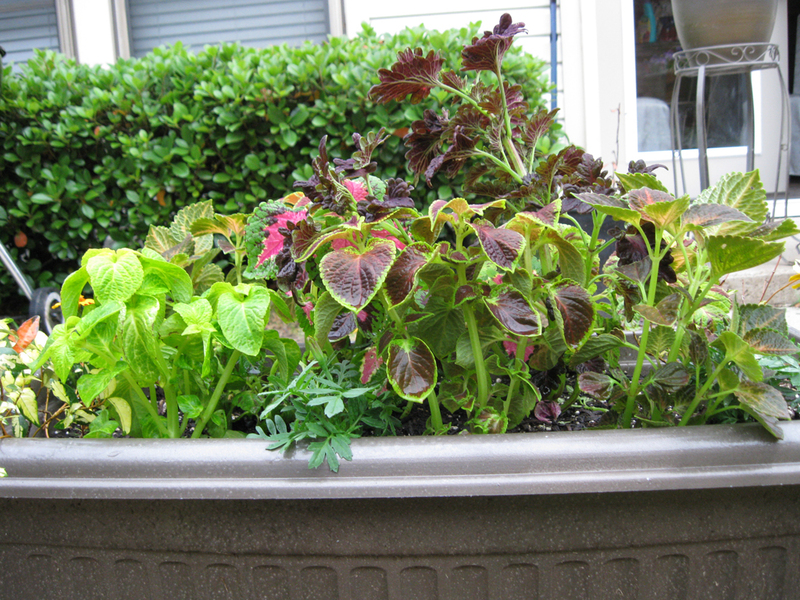 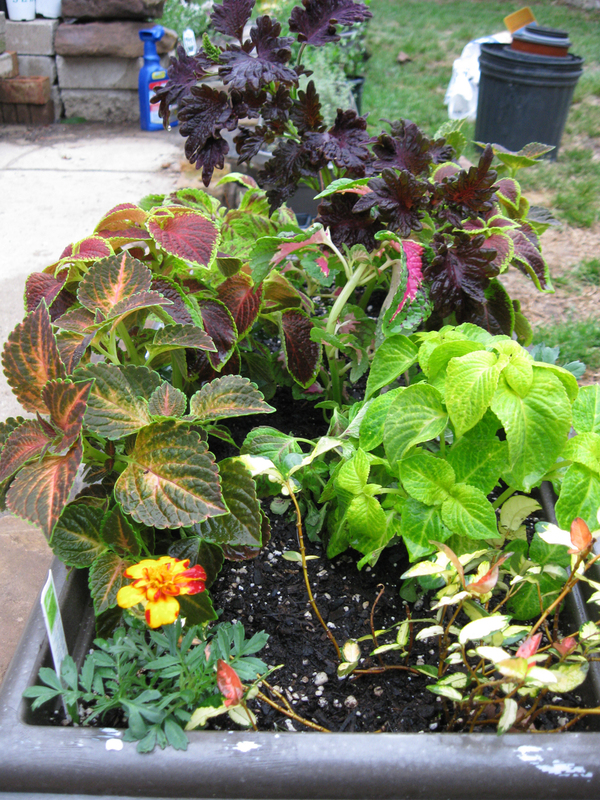 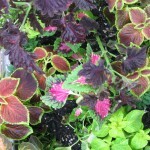 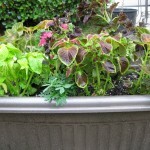 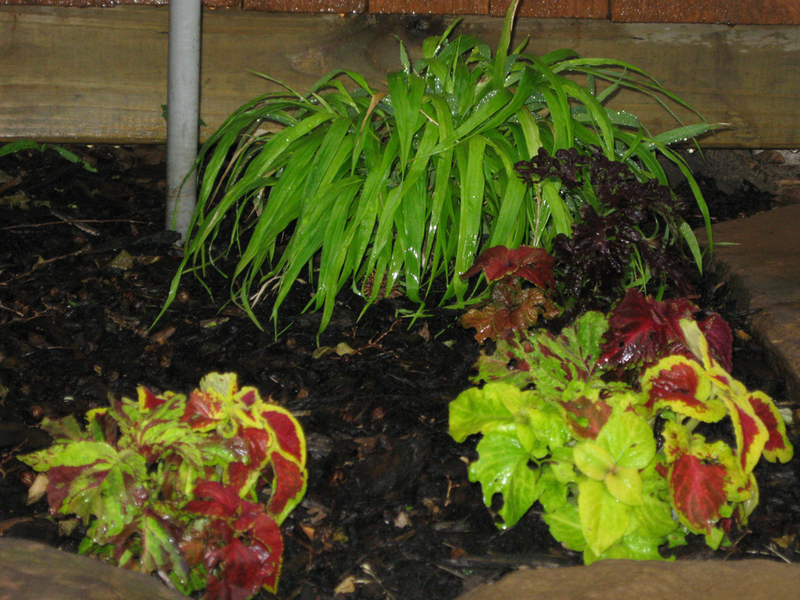 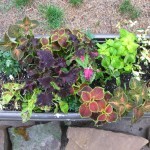 I still have plenty of coleus to spare as I consider setting up another planter box in the same theme. 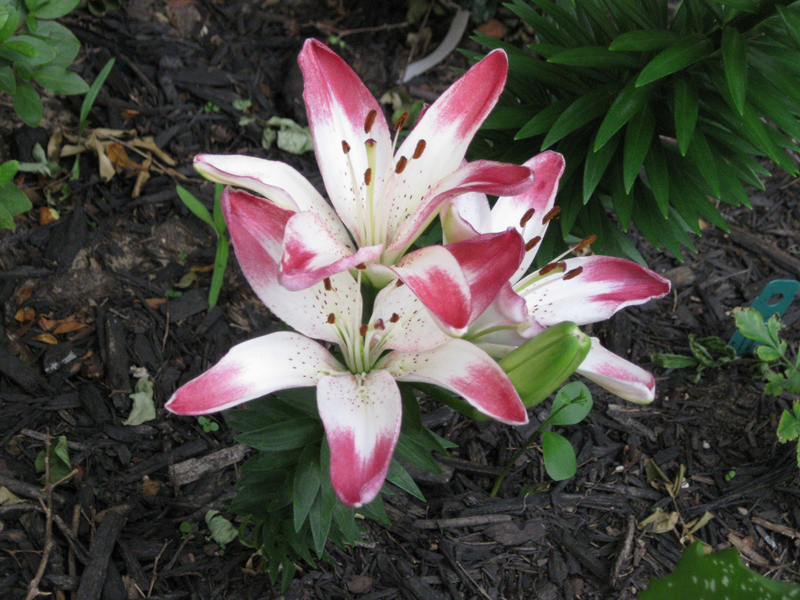 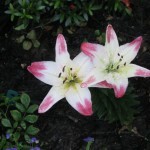 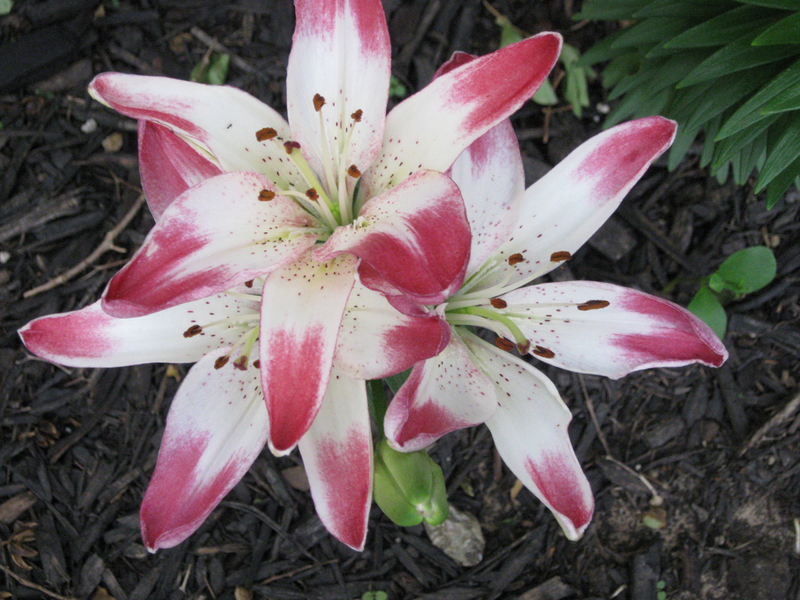 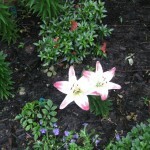 The first lily bloom is not surprisingly the shortest lilies in the flower beds: Lollypop. 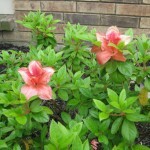 It made a showing last Saturday with 2 flowers. 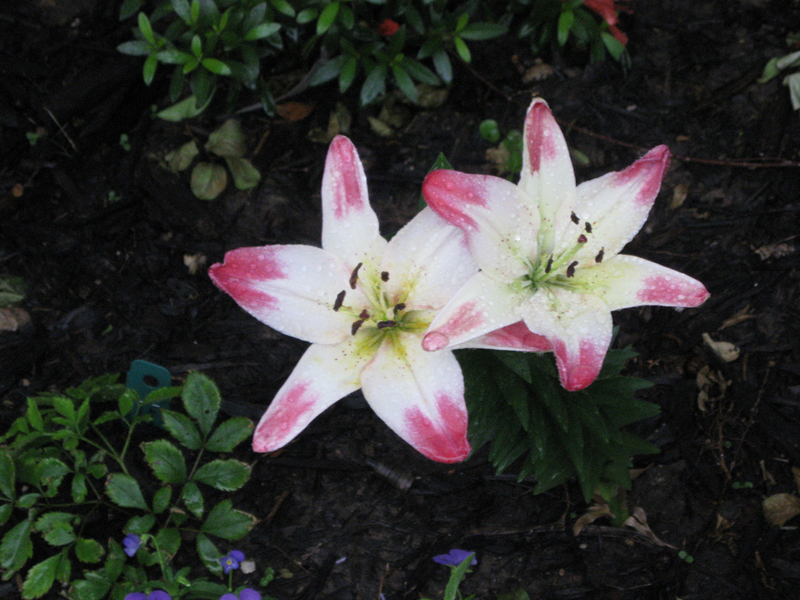 An even younger bulb boasts 3 pink-edged blooms on a 18″ trunk. 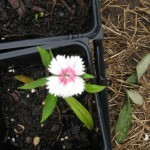 Another surprise bloomer is the Red Peppermint Super Parfait dianthus. 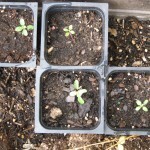 One of the seedlings hatched yesterday, and it appears several more seedlings are budding. 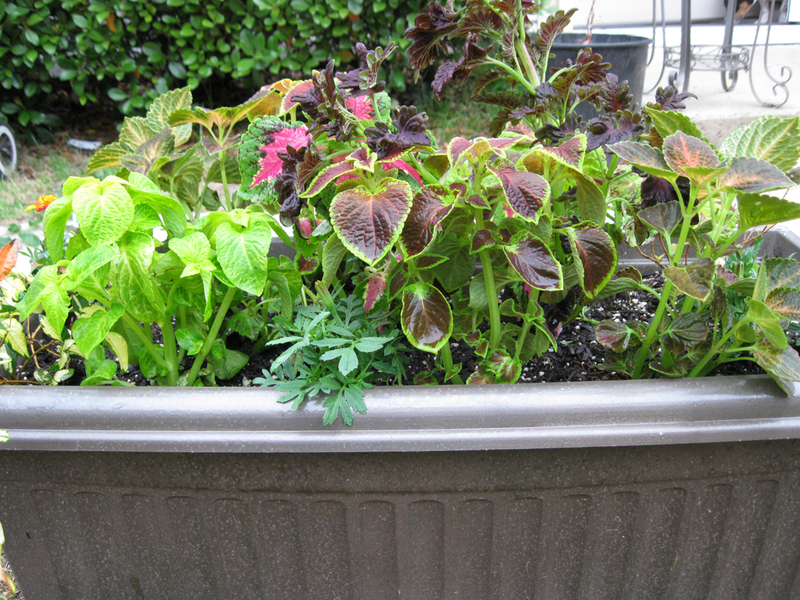 I’m not sure that I should pinch them back to stimulate more foliage. 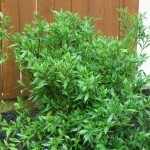 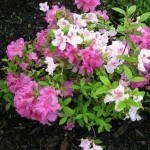 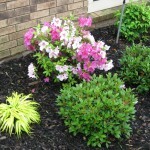 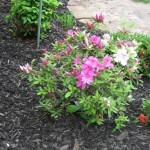 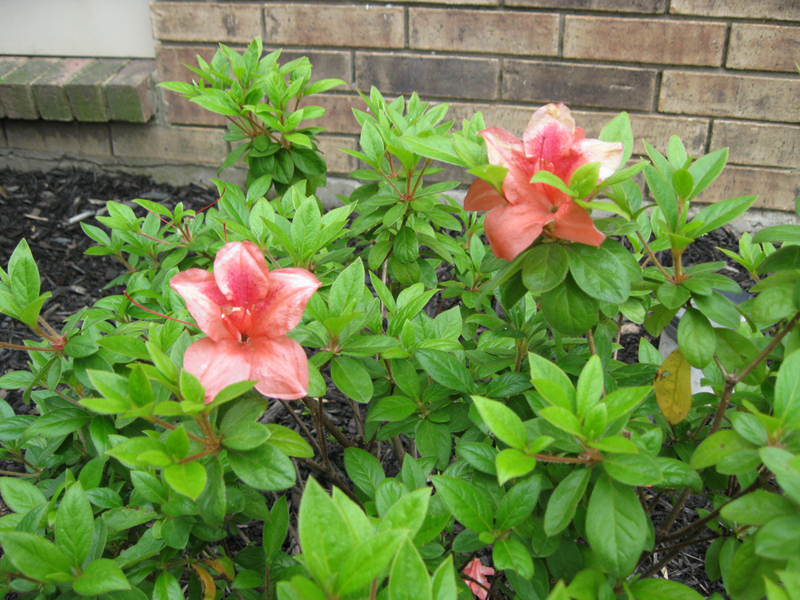 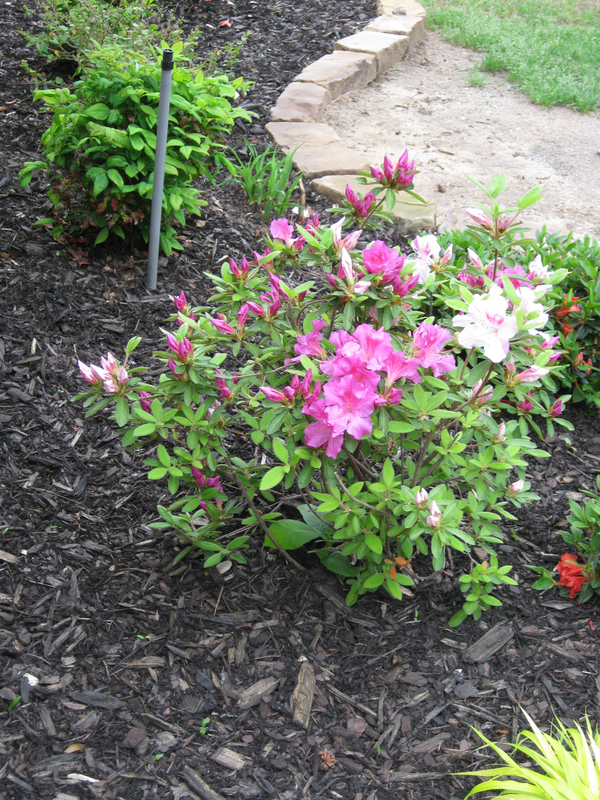 Other bloomers include Macrantha orange and white gumpo azaleas. 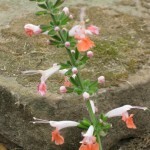 The orange actually looks more like what Crimson should have looked like, and the white gumpo is a pretty single-flowered form. 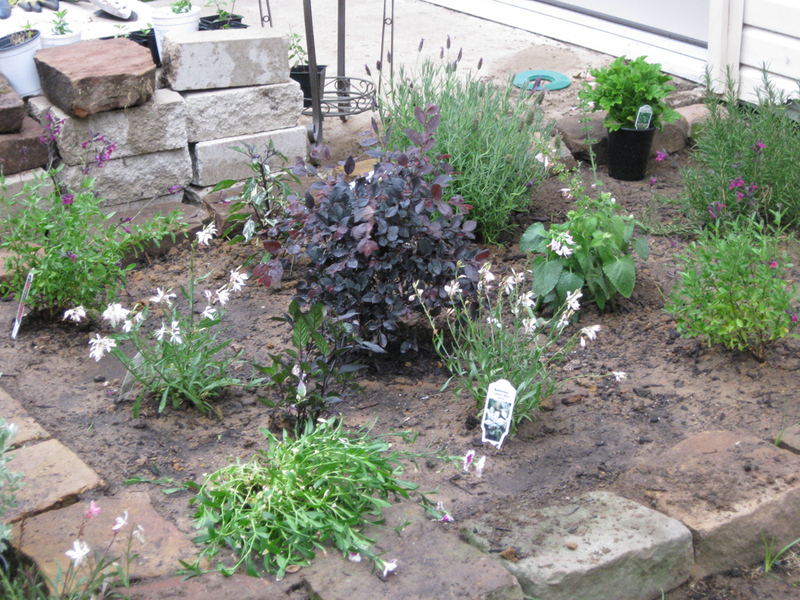 The first purple garden is in place, with the Lorapetalum as centerpiece, and rosemary Tuscan Blue close to the patio door, next to the house wall. 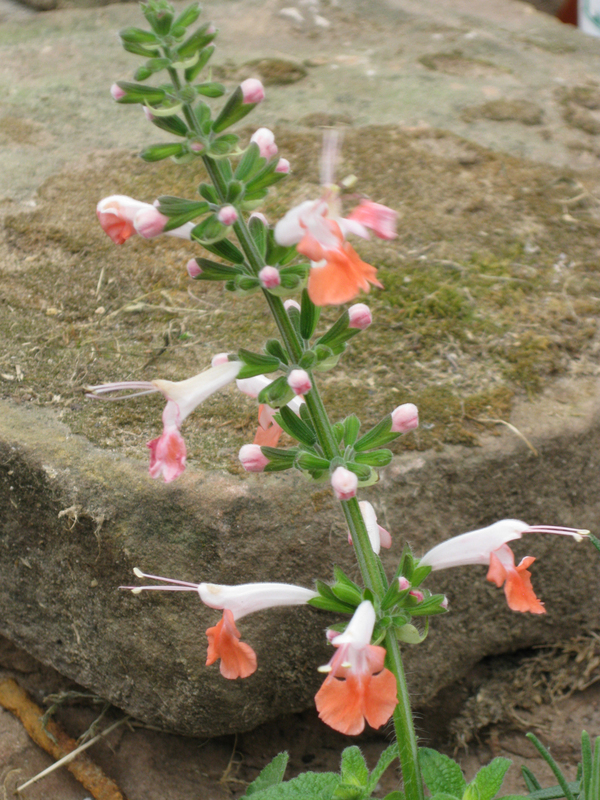 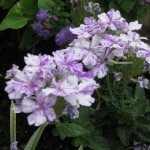 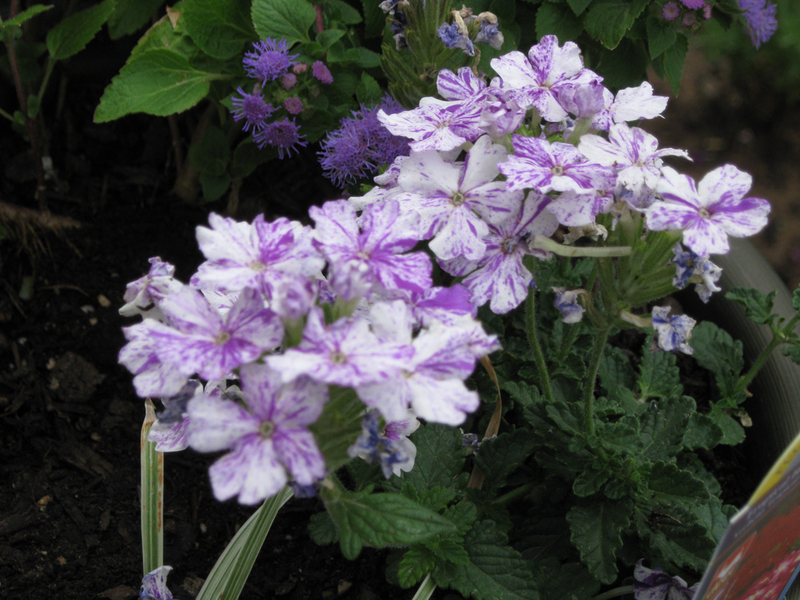 It is currently populated with 2 Compact Ballerina white gauras, one Calico and one Purple Flash ornamental pepper, one Spanish Lavender, 2 violet salvia greggiis and 3 bicolor salvia coccinea. 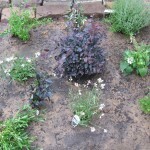 I also transplanted the purple picoteed dianthus from the lily bed to this one, since the colors worked well. 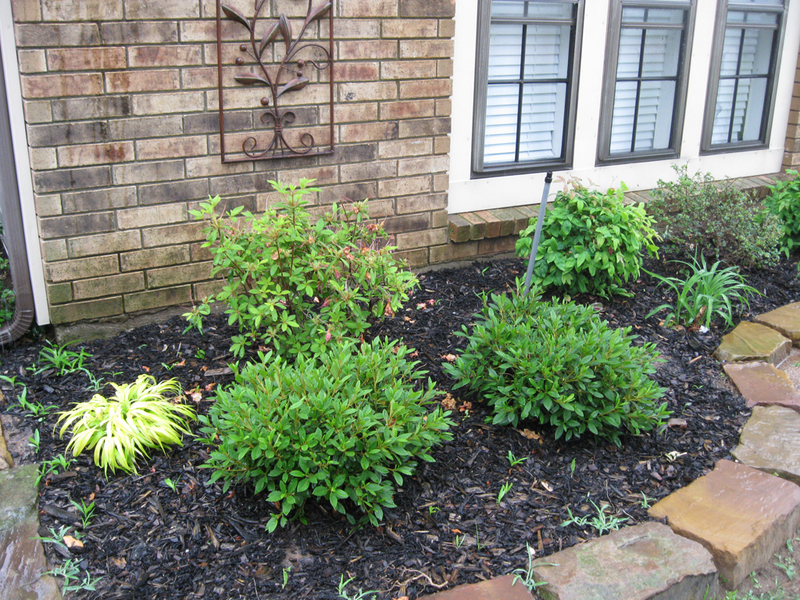 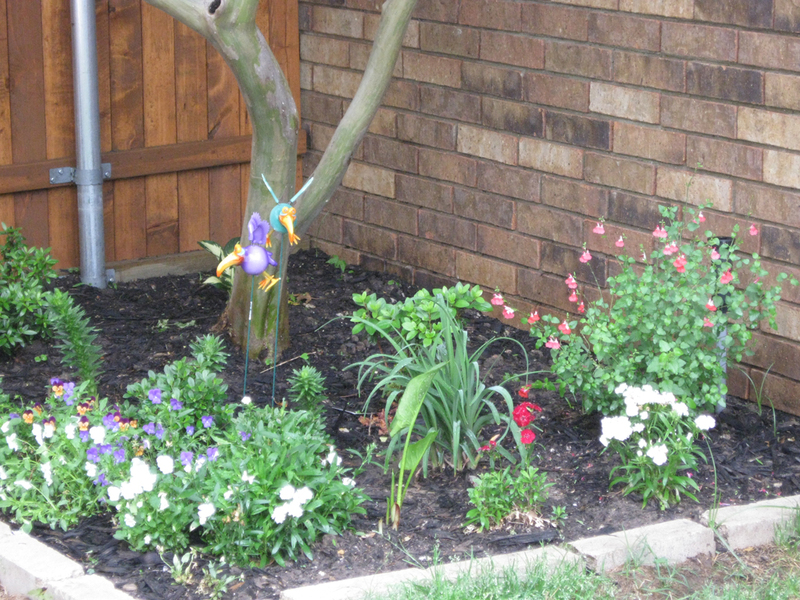 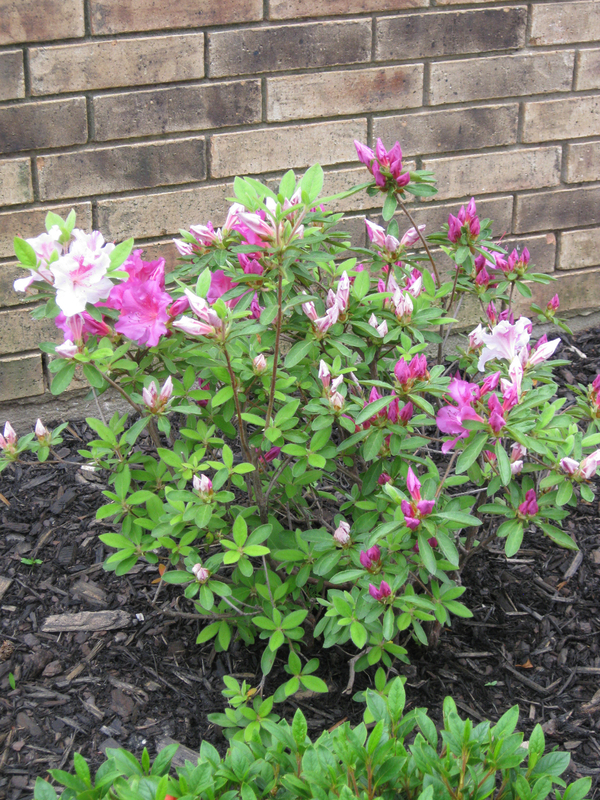 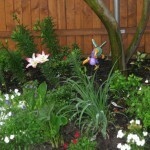 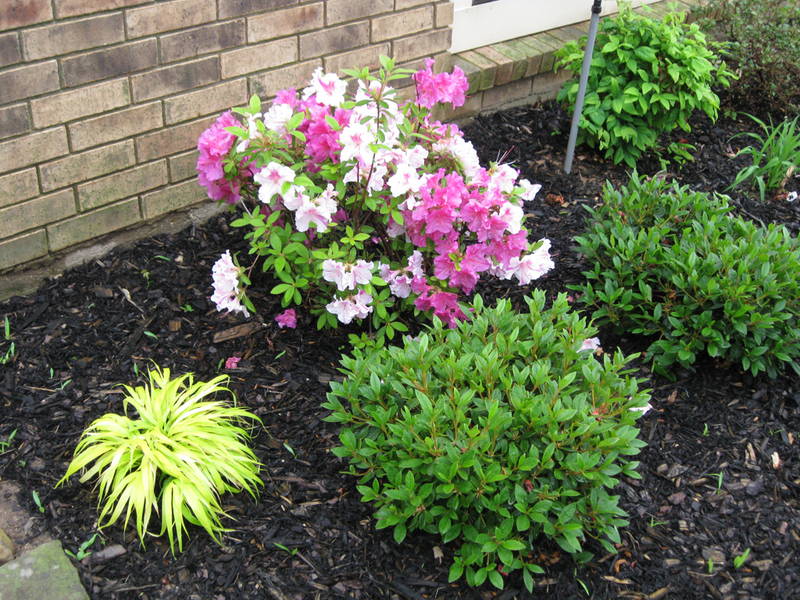 The 2 golden fleece and the Cherry Brandy gaura have been planted in the front flower bed, in front of the shorter azaleas. 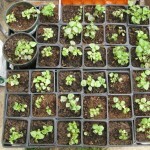 More seeds are in. 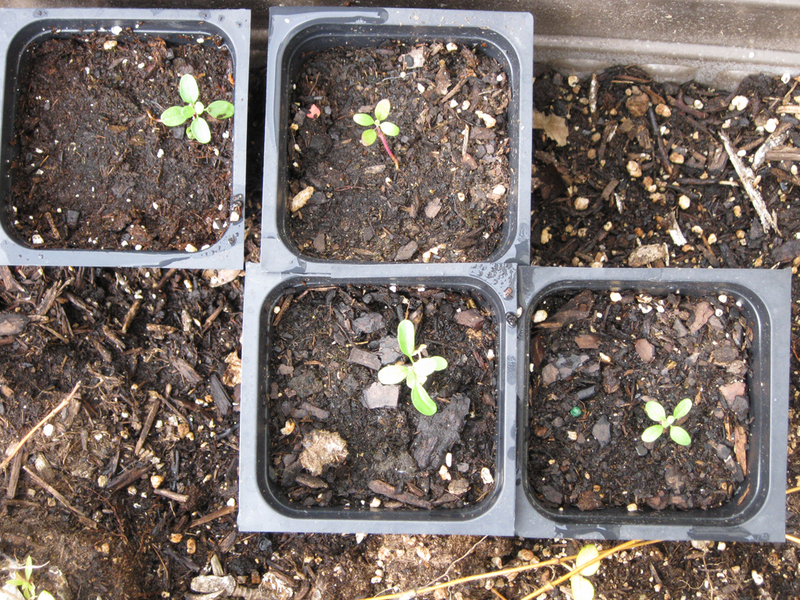 I get to experiment with the seed sower I purchased and give the Burpees pellets another shot. 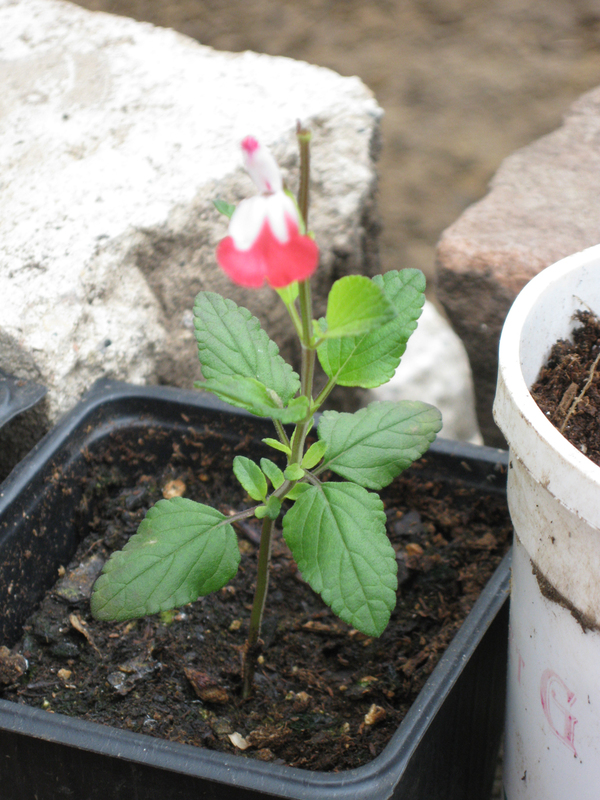 Don’t put out Impatiens seedlings out in the sun. 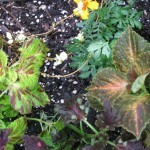 Despite copious amounts of watering, the tender leaves faded, threatening early seedling demise. 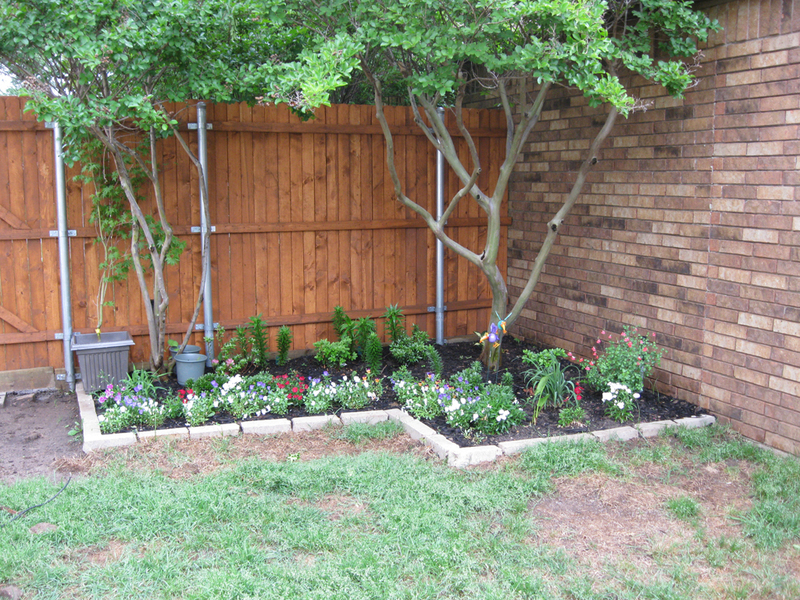 I immediately moved the impatiens flats into the shade of our photinia hedge, which seems to have improved their outlook. 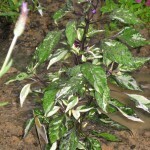 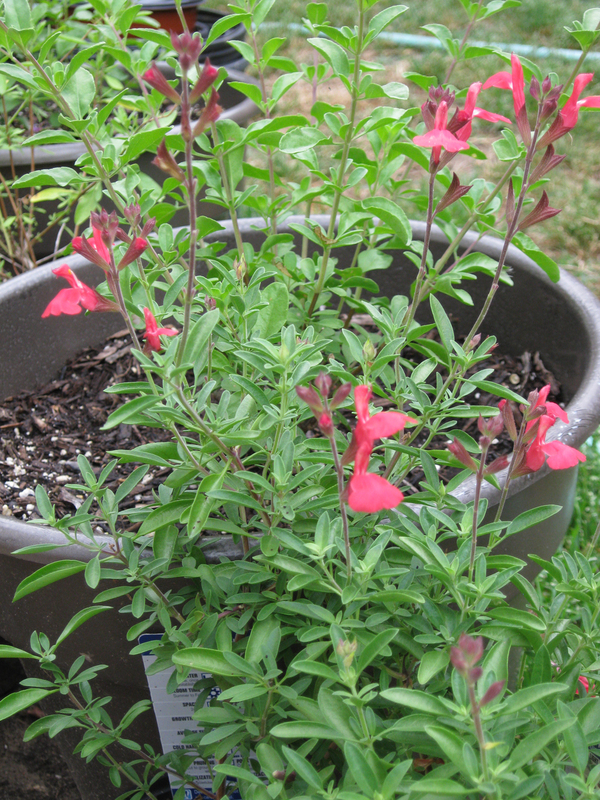 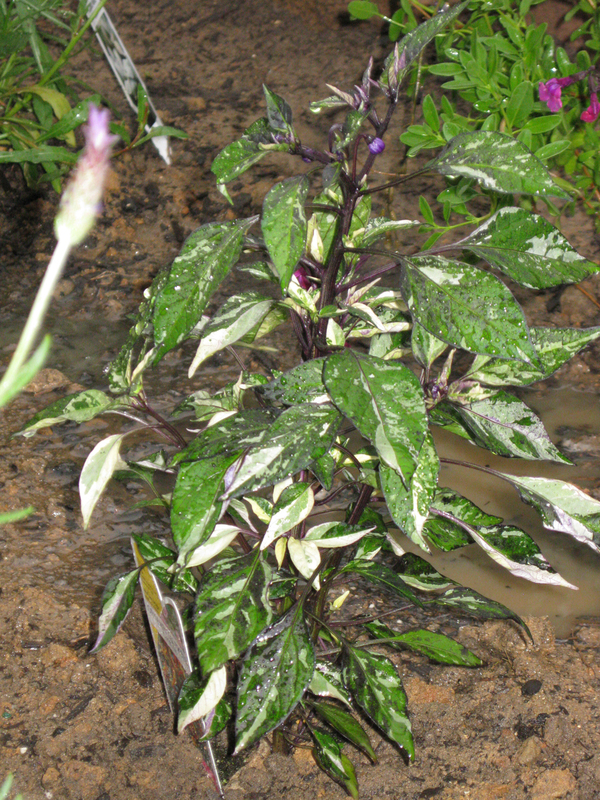 Fresh salvia cuttings need to stay in shade for a period of 1-2 weeks during spring. 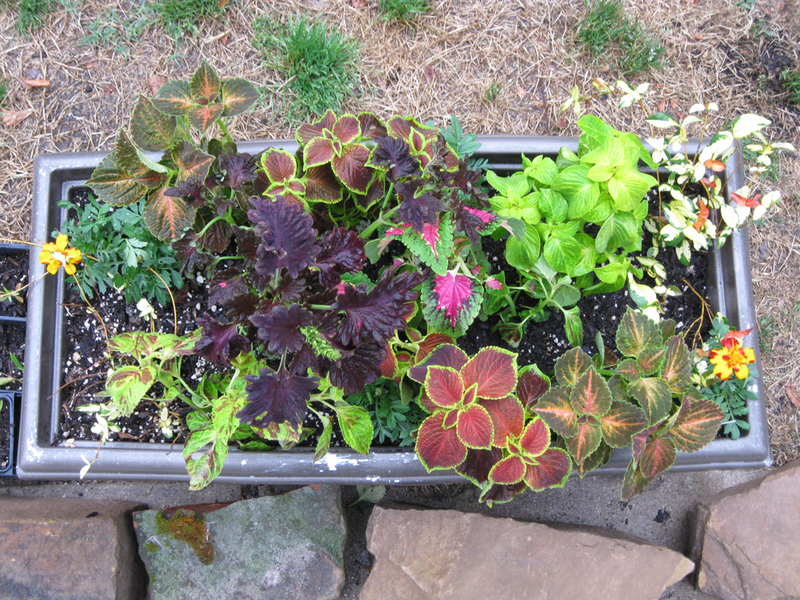 Getting full sun tends to dry them out too quickly. 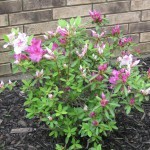 Also, it helps to direct their energy to rooting and leafing, so pinch off any buds that develop. 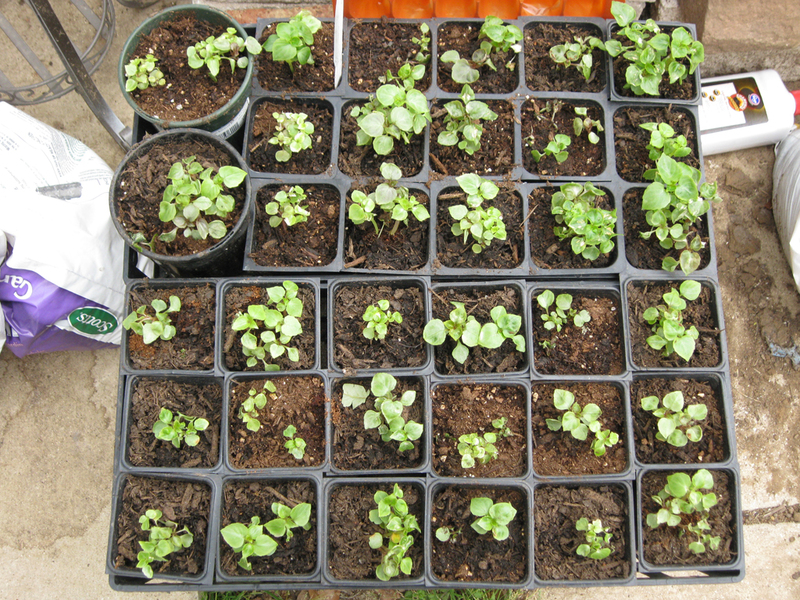 The cuttings I took from Hot Lips all budded, so I had to nip those right away. 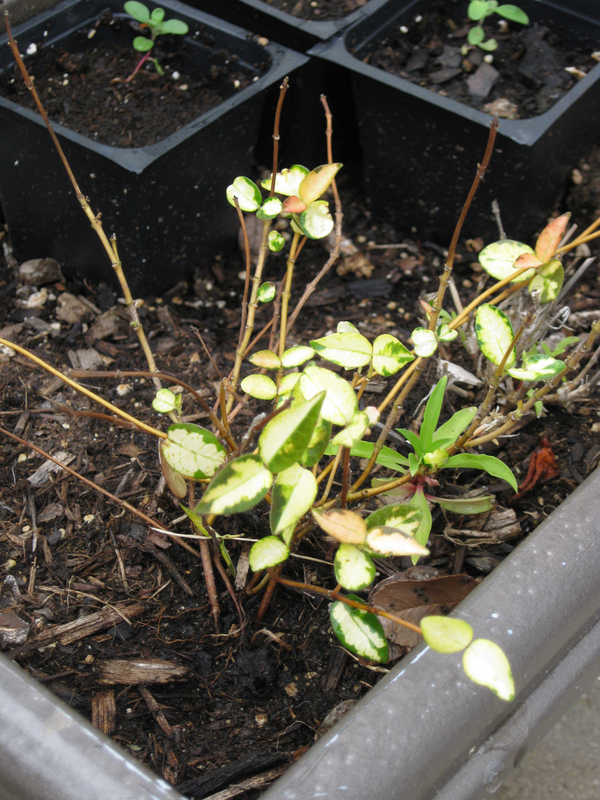 Luckily, the cuttings took root, and they are now residing outdoors to harden and grow. 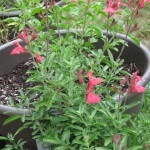 I have also half a dozen red salvia greggii cuttings that I’m waiting on to root, before they can share the sunlight with the other babies. 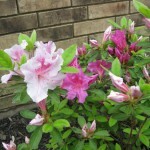 If you see a plant you want at the store, don’t hesitate to snap it up right away. 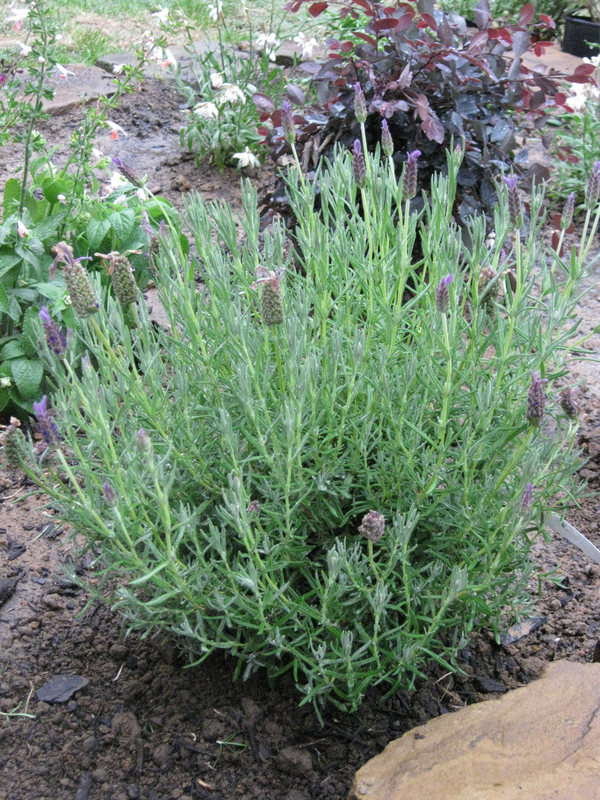 Especially Nepeta (a.k.a. 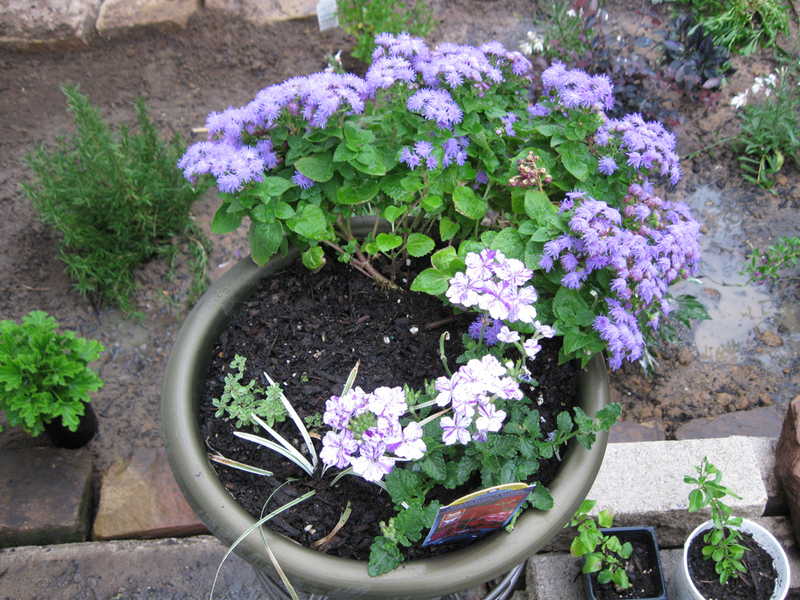 Catmint). 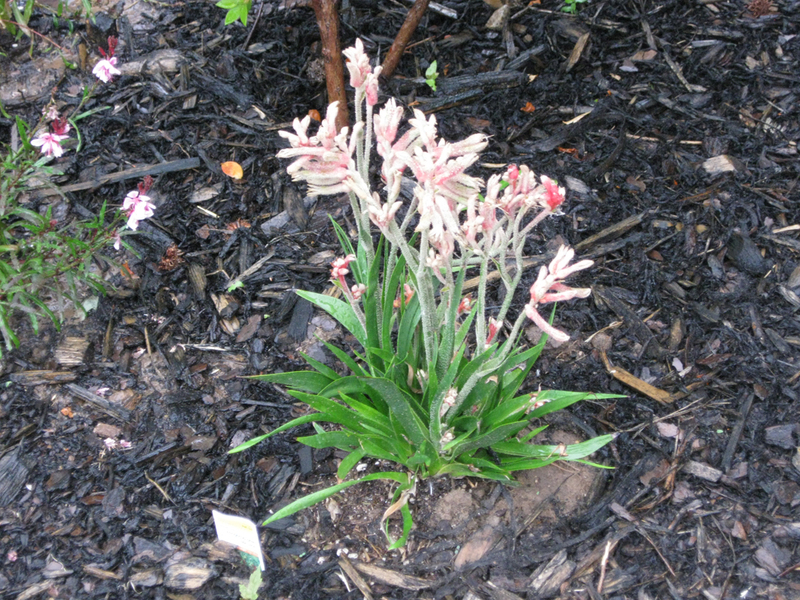 We saw several Walkers Low specimens at Covington’s a week or two ago, and were dismayed to learn they had been sold out on another visit yesterday. 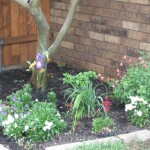 If it looks good, chances are it will sell right away. 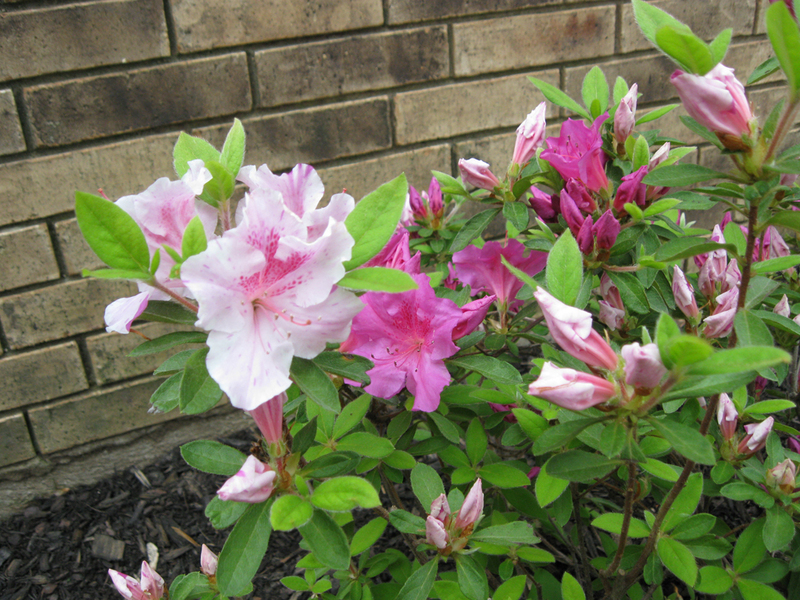 With this pleasant spring weather, consumers are flocking to garden centers in droves and picking up the prettiest plants currently in full bloom. 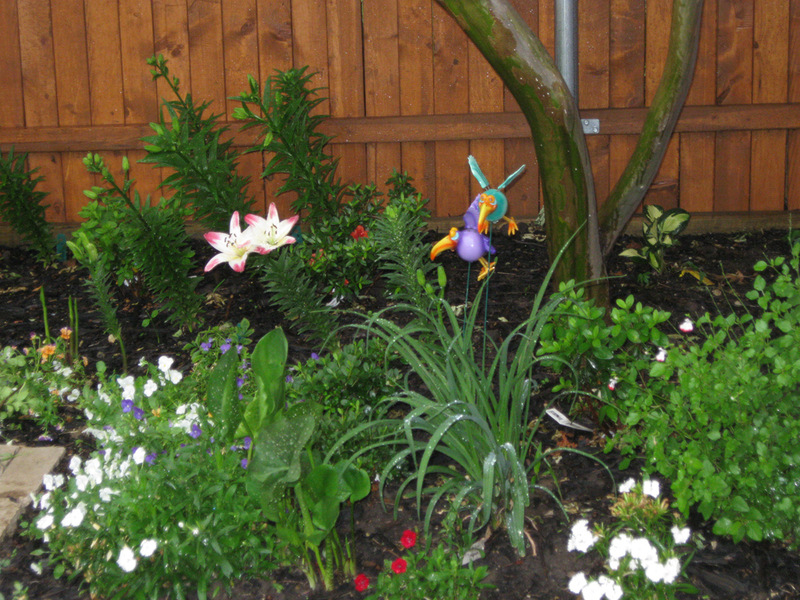 Take pictures of your garden frequently. 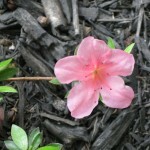 I can’t stress this enough. 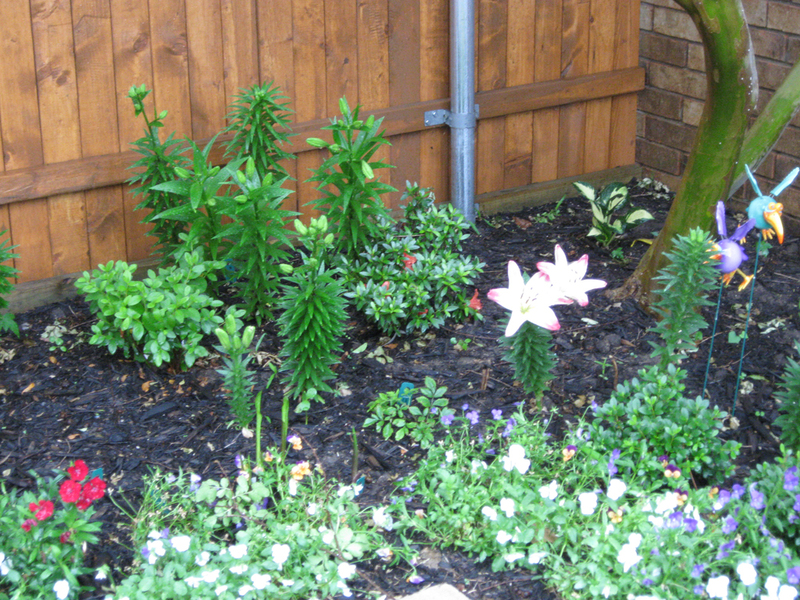 The garden looks different every day. 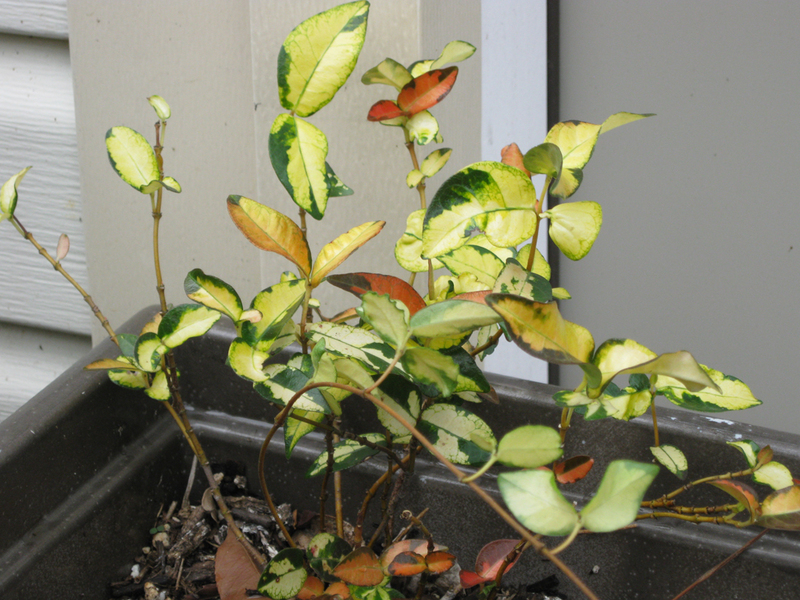 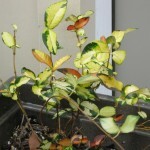 Flowers are ephemeral, lighting differs, new foliage continuously appear on old plants. 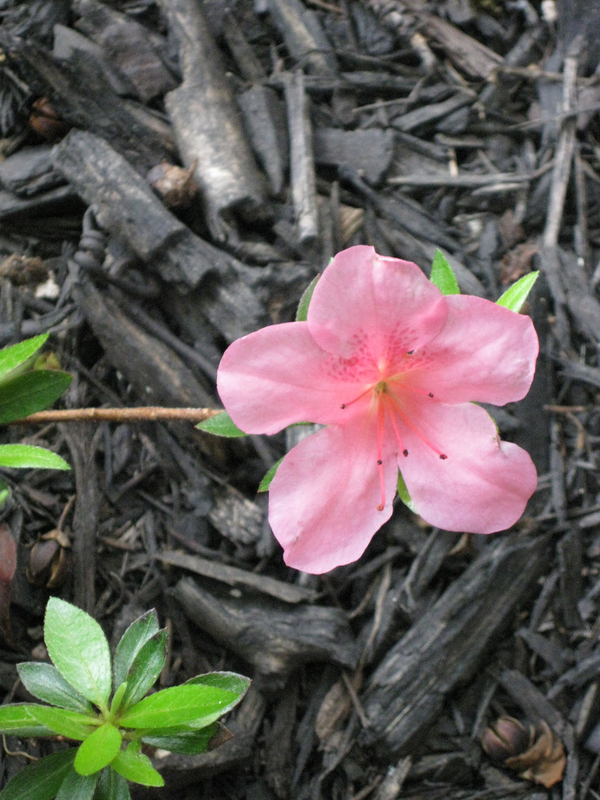 And your perspective will change throughout the day. 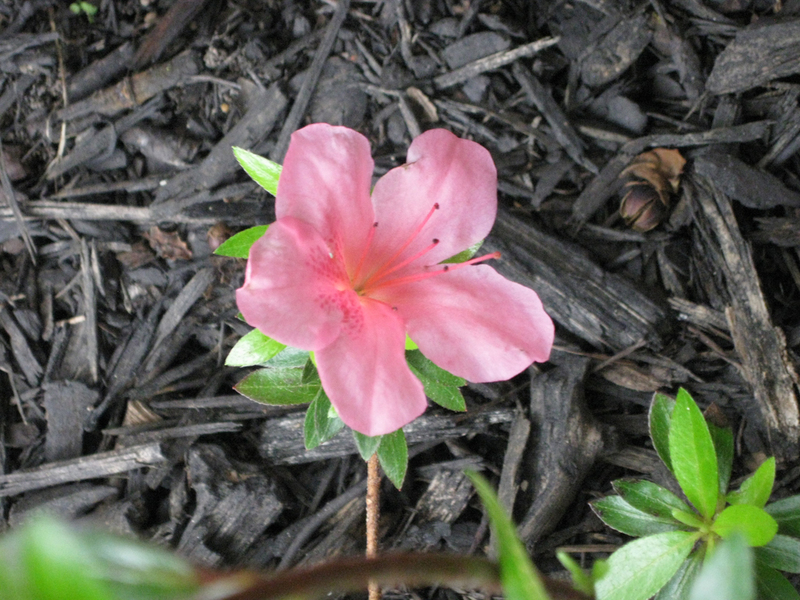 Beauty is fleeting, and a picture captures a single moment in time to preserve it forever.